ANTROPOMORPHIA releases video for ‘Murmur ov the Dead’! New album ‘Sermon ov Wrath’ out today! Today marks the day where AntropomorphiA returns with their latest collection of gospels of the obscene! Enter those stores now since ‘Sermon ov Wrath‘ is easily the band’s magnum opus as of yet! 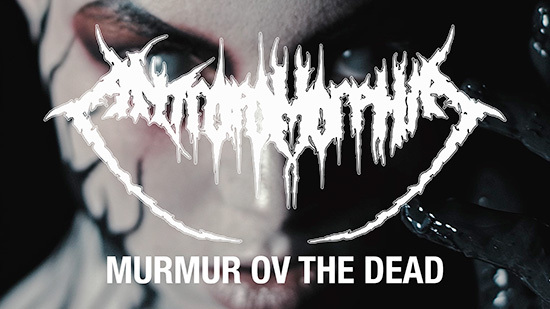 To celebrate the album release the band has now launched the first video for the new album and it’s for the song ‘Murmur Ov The Dead’! Head over to youtube.com/watch?v=yjEsmSvHQQE to check it out! The video was produced and edited my Maurice Swinkels (Legion Of The Damned). Afterwards head over to metalblade.com/antropomorphia where you can still check out the haunting title track as well as the 2nd single ‘Crown Ov The Dead’ featuring DOOL’s Ryanne van Dorst. ‘Sermon ov Wrath‘ is out on vinyl as well as on Digi-CD and is available for purchase at the same location! Featuring artwork by 13 Candles Tattoo/Madeleine Hoogkamer, ‘Sermon ov Wrath‘ was once again recorded at drummer Marco Stubbe’s Aftermath Studio, and then mastered by Tore Stjerna at Necromorbus Studio, giving the album a savage, crushing sound. As their most diverse record to-date, ‘Sermon ov Wrath‘ contains a bewitching atmosphere, furious groovy riffs, and merciless brutality – proving that the band is not afraid to experiment within the genre.